Some of the biggest ships that you’ll see today are container cargo ships. The largest container ships measure almost 400 metres in length, and can carry the same amount of cargo as 17 pre-war cargo boats! 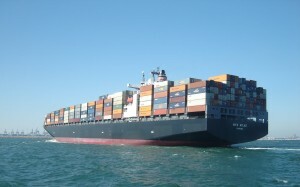 A container ship is like a huge warehouse which holds its cargo in pre-packed units – containers. You may have seen these, they look like a selection of giant LEGO bricks stacked together.